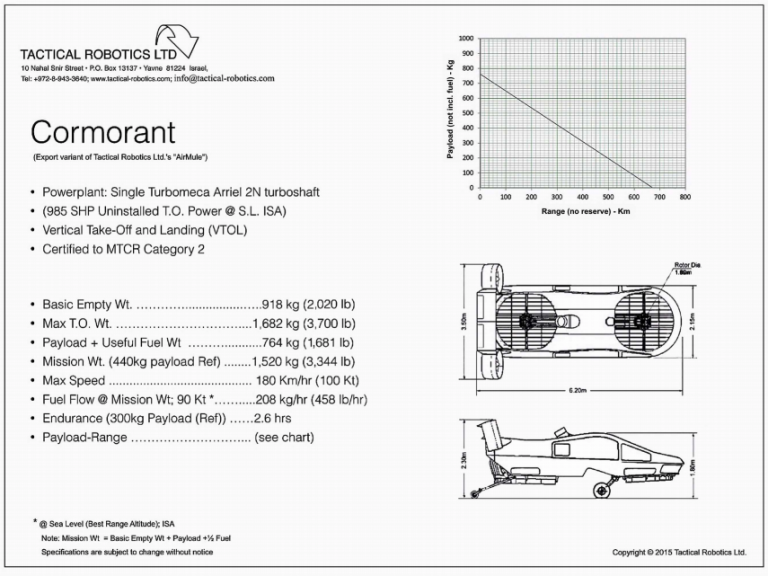 Tactical Robotics (a subsidiary of Urban Aeronautics Ltd.), based in Yavne, Israel, recently debuted its autonomous drone named Cormorant, a single-engine Vertical Take Off and Landing (VTOL) aircraft with internal lift rotors enabling it to land and take off almost anywhere. The drone’s radical new design offers life-saving technologies onto the modern battlefield and emergency disaster situations. Earlier this month, the Israel-based robotics company successfully completed its ﬁrst “mission representative” demonstration for its primary customer, the Israel Defence Forces (IDF). The demonstration was conducted at Megiddo Airﬁeld in the Galilee, according to the Tactical Robotics press release. The Cormorant drone performed a series of pre-planned ﬂights to a speciﬁed point of delivery, offloading specialized cargo, and loading of a manikin that simulated a wounded soldier on the battlefield, which was then returned to the point of origin. “The demonstration, a combination of cargo delivery and casualty evacuation, reﬂects Cormorant’s unique dual-role capability as the only UAS recognized by NATO to fulﬁll both cargo delivery and CasEvac missions. As such, the aircraft is designed to exceed the standard reliability and handling qualities required of a typical, tactical UAS in order to meet the requirements to safely ferry human “cargo” back from the battleﬁeld,” Tactical Robotics said. Cormorant’s rotor arrangement minimizes its footprint. Internal lift rotors embedded underneath the aircraft within the airframe — allows it access to obstructed areas with wires, buildings, forests, jungles, and even challenging terrain, where helicopters could never attempt a touchdown. The aircraft’s single turbocharged engine powers the two lift rotors and two smaller rotors mounted vertically on either side of the drone’s tail. 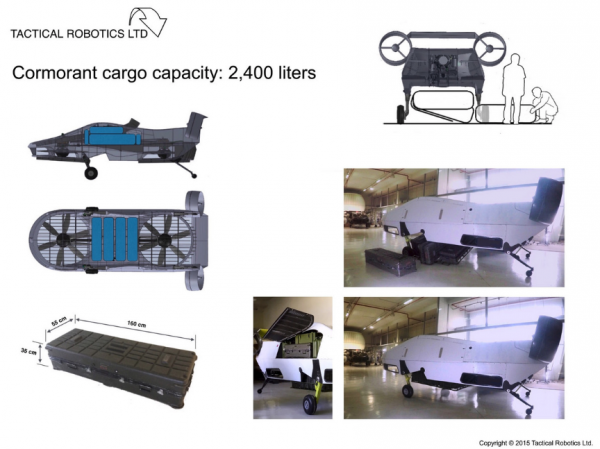 According to Tactical Robotics’s website, the engine gives the Cormorant the ability to lift over 1,000 pounds of cargo — or about two wounded soldiers. The mission range of the drone is about 30 miles at over 100 mph. The drone’s design followed the most stringent FAA design requirements for rotorcrafts, which could boost its chances for broad adoption in military, civilian, and even industrial applications. In 2017, Cormorant completed its first flight over low terrain, and, in 2018, the aircraft was recently tested for military applications by the IDF. The company expects the drone to be in full operational use by 2020, which could complement IDF soldiers in a war with Syria and or Iran.